While the holidays are certainly a fun time of year, they do come with a list of chores. Depending on how you see it, decorating for the holidays is probably a mix of both pain and pleasure. It’s fun having everything up and seeing the reactions of friends and family to your festiveness, but taking everything out and putting everything away again for another year can be tiresome. Not only that, but every time you take something out of storage, you run the risk of damaging it and having to replace it. Below are four tips for safely taking holiday decorations out of storage this holiday season. If you are shopping around for a storage facility for your holiday decorations, you might want to consider a company that offers its clients drive up storage options. This means you can pull your vehicle all the way up to the unit and avoid having to carry boxes all the way to the parking lot. The less distance you have to travel with something, the less chance there is for an accident and breakage. While you might think getting the decorations out is a one person job, it pays to have an extra set of hands, eyes, and ears when moving valuable and delicate Christmas decorations. Ask a friend or family member if they can spare a couple of hours helping you get your things out of storage. This is especially important if you have any big, bulky items, or if you have items stored on high shelves or in an attic, requiring the use of a ladder. Many storage facilities will offer you the use of a dolly if you don’t have your own. Dollies are those wheeled moving devices that use leverage to allow you to move large objects that you wouldn’t typically be able to carry on your own. Dollies come in all sizes, and if you are looking to get one for yourself, they can be purchased at most home and garden stores. When loading things into your vehicle, always but the big, bulky, dense items near the front, and the fragile ones near the back. When you brake during the ride home, momentum is going to force everything to the front. If you have your big, heavy items at the back, and your smaller fragile items at the front, those big heavy items are going to be crushing the smaller, breakable decorations. 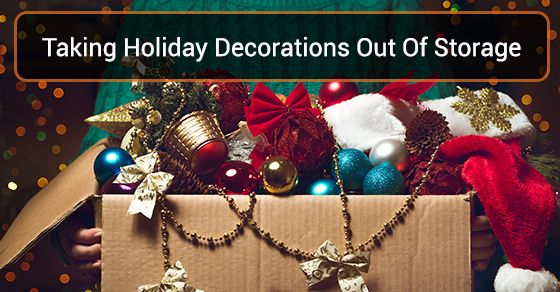 It’s understandable that people want to get their decorations out of storage, into their vehicle, and up in their home as fast as possible, but there are some precautions to take to ensure you do not damage or ruin your treasured holiday decorations. Keep the above removal tips in mind this holiday season and make sure you don’t lose one single decoration.